Pancreatitis is inflammation of the pancreas. 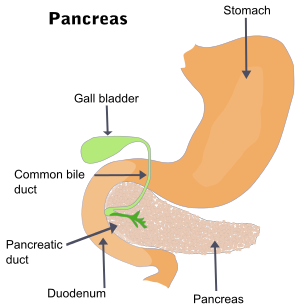 The pancreas is a large organ behind the stomach which produces digestive enzymes. There are two main types, acute pancreatitis and chronic pancreatitis. Symptoms of pancreatitis include pain in the upper abdomen, nausea and vomiting. The pain often goes into the back and is usually severe. In acute pancreatitis a fever may occur and symptoms typically resolve in a few days. In chronic pancreatitis weight loss, fatty stool, and diarrhea may occur. Complications may include infection, bleeding, diabetes, or problems with other organs. The most common causes of acute pancreatitis are gallstones and heavy alcohol use. Other causes include direct trauma, certain medications, infections such as mumps, and tumors among others. Chronic pancreatitis may develop as a result of acute pancreatitis. It is most commonly due to many years of heavy alcohol use. Other causes include high levels of blood fats, high blood calcium, some medications, and certain genetic disorders such as cystic fibrosis among others. Smoking increases the risk of both acute and chronic pancreatitis. Diagnosis of acute pancreatitis is based on a threefold increase in the blood of either amylase or lipase. In chronic pancreatitis these tests may be normal. Medical imaging such as ultrasound and CT scan may also be useful. Acute pancreatitis is usually treated with intravenous fluids, pain medication, and sometimes antibiotics. Typically no eating or drinking is allowed and a tube may be placed into the stomach. A procedure known as a endoscopic retrograde cholangiopancreatography (ERCP) may be done to open the pancreatic duct if blocked. In those with gallstones the gallbladder is often also removed. In chronic pancreatitis, in addition to the above, temporary feeding through a nasogastric tube may be used to provide adequate nutrition. Long-term dietary changes and pancreatic enzyme replacement may be required. And occasionally surgery is done to remove parts of the pancreas. Acute pancreatitis occurs in about 30 per 100,000 people a year. New cases of chronic pancreatitis develop in about 8 per 100,000 people a year and currently affect about 50 per 100,000 people in the United States. Globally, in 2013 pancreatitis resulted in 123,000 deaths up from 83,000 deaths in 1990. It is more common in men than women. Often chronic pancreatitis starts between the ages of 30 and 40 while it is rare in children. Acute pancreatitis was first described on autopsy in 1882 while chronic pancreatitis was first described in 1946. The most common symptoms of pancreatitis are severe upper abdominal or left upper quadrant burning pain radiating to the back, nausea, and vomiting that is worsened with eating. The physical examination will vary depending on severity and presence of internal bleeding. Blood pressure may be elevated by pain or decreased by dehydration or bleeding. Heart and respiratory rates are often elevated. The abdomen is usually tender but to a lesser degree than the pain itself. As is common in abdominal disease, bowel sounds may be reduced from reflex bowel paralysis. Fever or jaundice may be present. Chronic pancreatitis can lead to diabetes or pancreatic cancer. Unexplained weight loss may occur from a lack of pancreatic enzymes hindering digestion. Eighty percent of cases of pancreatitis are caused by alcohol or gallstones. Gallstones are the single most common cause of acute pancreatitis. Alcohol is the single most common cause of chronic pancreatitis. Some medications are commonly associated with pancreatitis, most commonly corticosteroids such as prednisolone, but also including the HIV drugs didanosine and pentamidine, diuretics, the anticonvulsant valproic acid, the chemotherapeutic agents L-asparaginase and azathioprine, estrogen by way of increased blood triglycerides, and antihyperglycemic agents like metformin, vildagliptin, and sitagliptin. It may be noted here that the drugs which are used to treat conditions which are themselves associated with increased events of pancreatitis may also be incidentally linked to pancreatitis. Examples include statins in dyslipidemia and gliptins in diabetes. According to the Food and Drug Administration's MedWatch Surveillance System and Published Reports Atypical, atypical antipsychotics such as clozapine, risperidone, and olanzapine can also be responsible for causing pancreatitis. Other common causes include trauma, mumps, autoimmune disease, high blood calcium, hypothermia, and endoscopic retrograde cholangiopancreatography (ERCP). Pancreas divisum is a common congenital malformation of the pancreas that may underlie some recurrent cases. Diabetes mellitus type 2 is associated with a 2.8-fold higher risk. Less common causes include pancreatic cancer, pancreatic duct stones, vasculitis (inflammation of the small blood vessels in the pancreas), coxsackievirus infection, and porphyria—particularly acute intermittent porphyria and erythropoietic protoporphyria. There is an inherited form that results in the activation of trypsinogen within the pancreas, leading to autodigestion. Involved genes may include Trypsin 1, which codes for trypsinogen, SPINK1, which codes for a trypsin inhibitor, or cystic fibrosis transmembrane conductance regulator. ● Blood amylase or lipase will be 4-6 times higher than the normal variations, but this will be dependent on the laboratory that is testing the blood. ● Abdominal ultrasound is generally performed first, which is advantageous for the diagnosis of the causes of the pancreas, for example, detecting gallstones, diagnosing alcoholic fatty liver (combined with history of alcohol consumption). They are both the main causes of pancreatitis. Abdominal ultrasound also shows an inflamed pancreas clearly. It is convenient, simple, non-invasive, and inexpensive. Amylase or lipase is frequently part of the diagnosis; lipase is generally considered a better indicator, but this is disputed. Cholecystitis, perforated peptic ulcer, bowel infarction, and diabetic ketoacidosis can mimic pancreatitis by causing similar abdominal pain and elevated enzymes. The diagnosis can be confirmed by ultrasound and/or CT. The treatment of pancreatitis is supportive and depends on severity. Morphine generally is suitable for pain control. There is a claim that morphine may constrict the sphincter of Oddi, but this is controversial. There are no clinical studies to suggest that morphine can aggravate or cause pancreatitis or cholecystitis. The treatment that is received for acute pancreatitis will depend on whether the diagnosis is for the mild form of the condition, which causes no complications, or the severe form, which can cause serious complications. The treatment of mild acute pancreatitis is successfully carried out by admission to a general hospital ward. Traditionally, people were not allowed to eat until the inflammation resolved but more recent evidence suggests early feeding is safe and improves outcomes. Because pancreatitis can cause lung damage and affect normal lung function, oxygen is occasionally delivered through breathing tubes that are connected via the nose. The tubes can then be removed after a few days once it is clear that the condition is improving. Dehydration may result during an episode of acute pancreatitis, so fluids will be provided intravenously. The pain associated with even mild or moderate cases of acute pancreatitis can be severe, which means that a narcotic pain killer may be required. Severe pancreatitis is associated with organ failure, necrosis, infected necrosis, pseudocyst and abscess. If diagnosed with severe acute pancreatitis, people will need to be admitted to a high dependency unit or intensive care unit. It is likely that the levels of fluids inside the body will have dropped significantly as it diverts bodily fluids and nutrients in an attempt to repair the pancreas. The drop in fluid levels can lead to a reduction in the volume of blood within the body, which is known as hypovolemic shock. Hypovolemic shock can be life-threatening as it can very quickly starve the body of the oxygen-rich blood that it needs to survive. To avoid going into hypovolemic shock, fluids will be pumped intravenously. Oxygen will be supplied through tubes attached to the nose and ventilation equipment may be used to assist with breathing. Feeding tubes may be used to provide nutrients, combined with appropriate analgesia. As with mild acute pancreatitis, it will be necessary to treat the underlying cause - gallstones, discontinuing medications, cessation of alcohol, etc. If the cause is gallstones, it is likely that an ERCP procedure or removal of the gallbladder will be recommended. The gallbladder should be removed during the same hospital admission or within two weeks of the pancreatitis so as to limit the risk of recurrent pancreatitis. If the cause of pancreatitis is alcohol, cessation of alcohol consumption and treatment for alcohol dependency may improve the pancreatitis. Even if the underlying cause is not related to alcohol consumption, doctors recommend avoiding it for at least six months as this can cause further damage to the pancreas during the recovery process. Oral intake, especially fats, is generally restricted initially but early enteral feeding within 48 hours has been shown to improve clinical outcomes. Fluids and electrolytes are replaced intravenously. Nutritional support is initiated via tube feeding to surpass the portion of the digestive tract most affected by secreted pancreatic enzymes if there is no improvement in the first 72–96 hours of treatment. 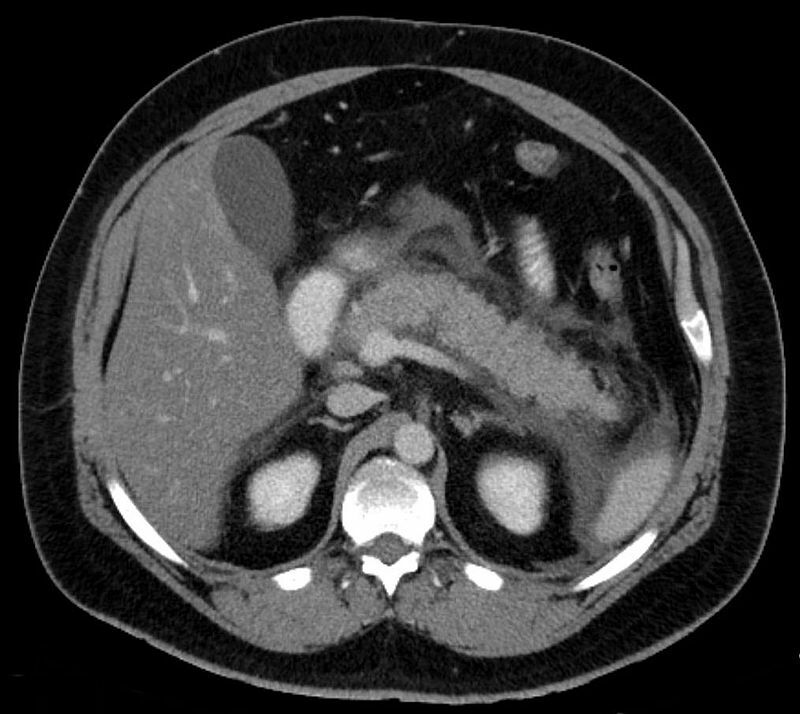 Severe acute pancreatitis has mortality rates around 2-9%, higher where necrosis of the pancreas has occurred. The BISAP score (Blood urea nitrogen level >25 mg/dL, Impaired mental status, Systemic inflammatory response syndrome, age over 60 years, pleural effusion) has been validated as similar to other prognostic scoring systems. Early complications include shock, infection, systemic inflammatory response syndrome, low blood calcium, high blood glucose, and dehydration. Blood loss, dehydration, and fluid leaking into the abdominal cavity (ascites) can lead to kidney failure. Respiratory complications are often severe. Pleural effusion is usually present. Shallow breathing from pain can lead to lung collapse. Pancreatic enzymes may attack the lungs, causing inflammation. Severe inflammation can lead to intra-abdominal hypertension and abdominal compartment syndrome, further impairing renal and respiratory function and potentially requiring management with an open abdomen to relieve the pressure. Late complications include recurrent pancreatitis and the development of pancreatic pseudocysts—collections of pancreatic secretions that have been walled off by scar tissue. These may cause pain, become infected, rupture and bleed, block the bile duct and cause jaundice, or migrate around the abdomen. Acute necrotizing pancreatitis can lead to a pancreatic abscess, a collection of pus caused by necrosis, liquefaction, and infection. This happens in approximately 3% of cases, or almost 60% of cases involving more than two pseudocysts and gas in the pancreas.